This CTS Knowledge Base article summarizes the most prevalent DPF ash cleaning process available. The article presents the application of new cleaning techniques, as well as a customized approach to ash cleaning based on the specific ash properties and distribution in the DPF. A number of ash cleaning systems exist, with the most common being pneumatic-based which utilizes reverse flow of air through the DPF to blow out accumulated material. The frequency of filter cleaning is generally specified by the engine or equipment manufacturer, based on pre-determined maintenance intervals. The actual frequency of DPF ash cleaning will depend on many factors including the effectiveness of an previous cleanings (i.e. amount of residual ash), engine oil consumption, and the vehicle drive cycle. The ease with which ash can be removed form the DPF channels depends on two primary factors, namely the strength of the ash bond to the DPF walls and the location of the ash deposits within the filter. For most DPF applications, a large quantity of the ash is packed in the end plugs. This type of ash is generally the most difficult to remove using conventional pneumatic cleaning approaches. Regardless of the specific cleaning system, pneumatic approaches are limited by fluid dynamics which drive the flow along the path of least resistance. As shown in Figure 1(a), reverse flow bypasses much of the ash plug, flowing instead around the plug and through the open portion of the channels. While pneumatic cleaning processes can be effective in removing ash accumulated in a layer along the DPF channel walls, complete removal of the ash plugged sections is often difficult. 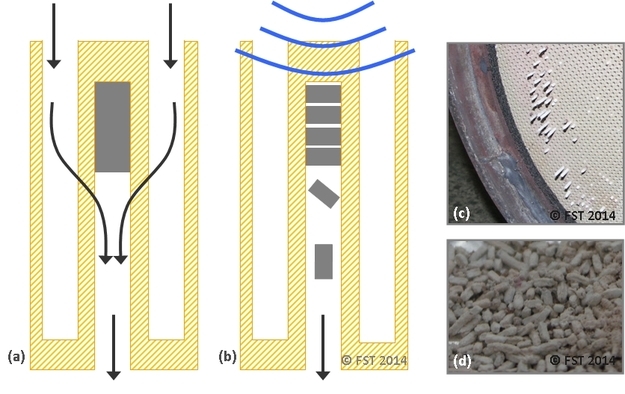 Our AccelaClean technology applies targeted high-frequency vibrations to the ash plugged region of the filter, as shown in Figure 1(b) to break up the ash plugs and facilitate their transport out of the DPF. Figure 1(c) shows an additional image of ash plugs protruding from the DPF face mid-way through the cleaning process, and Figure 1(d) shows a close-up view of the ash plugs removed from the DPF. Even after removal from the DPF, these hardened ash deposits still retain the shape of the DPF channels. Ash cleaning intervals and guidelines are generally specified by the engine, vehicle, or DPF system manufacturer. Most guidelines suggest periodic maintenance intervals for the DPF, based on assumptions about the filter’s operating conditions. Current EPA regulations require the DPF be sized to accommodate a minimum ash cleaning interval of at least 150,000 miles (240,000 km) for heavy-duty applications . As these Knowledge Base articles show, the actual maintenance intervals may be longer or shorter depending on the specific ash sources, distribution, and operating conditions of the engine and DPF. Circumstantial evidence indicates more frequent ash cleaning may allow for easier ash removal and more complete filter recovery as the ash has experienced less time in the filter (fewer thermal events, less sintering, lower packing density, etc. ); however, a comprehensive investigation of ash cleaning intervals and their impact on cleaning effectiveness remains to be seen. In addition to the service interval, the specific cleaning methods applied to the filter depend largely on the location and type of ash deposits as well as the amount of residual soot in the DPF. Although the soot can easily be removed through regeneration, removal of the ash requires specialized cleaning processes. While conventional pneumatic processes may be suitable for filters with large quantities of ash along the channel walls or relatively loose ash in the end plugs, filters with more difficult ash deposits will require more specialized cleaning. In some cases, extremely hard-sintered or melted ash in the DPF may not be possible to remove regardless of the cleaning process. Given the large differences in ash properties and distribution, detailed inspection of the DPF prior to cleaning is important to identify the nature of the deposits and determine the most appropriate cleaning methods. DPF inspection and the data resulting from these measurements is also crucial in tracking the health of the DPF over time and in developing cost effective maintenance strategies based on the filter applications. Not all DPF ash is the same, and not all DPFs benefit equally from the same type of cleaning process. Filters can be most efficiently cleaned and recovered when the selected process targets the specific ash deposits present within the filter. DPF inspection and diagnostics are key components of any cleaning process, ensuring effectiveness while tracking filter health. Manufacturers of Emission Controls Association (MECA): “Diesel Particulate Filter Maintenance: Current Practices and Experience,” Washington D.C., 2005.